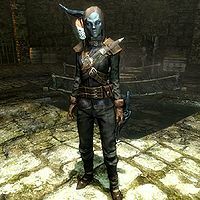 Karliah is a Dunmer thief, and a member of the Nightingales. She is also a former member of Skyrim's Thieves Guild but has spent the last 25 years in exile after allegedly murdering her former Guildmaster, Nightingale, and lover: Gallus. She will eventually become a quest giver and temporary follower after advancing in the Thieves Guild questline. 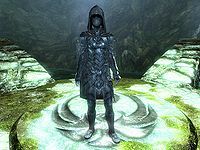 Karliah's unique outfit consists of her armor, her gloves, her boots and her hood. She also carries around a leveled dagger, leveled arrows and her bow. After the quest Trinity Restored, her outfit changes to a set of Nightingale armor, which includes a pair of Nightingale gloves, a pair of Nightingale boots and a Nightingale hood. She also switches to the Nightingale bow which she subsequently gives to you after the quest Blindsighted. According to the book The Nightingales Vol.2, Karliah's maternal grandparents are Queen Barenziah and a Nightingale thief by the name of Drayven Indoril. 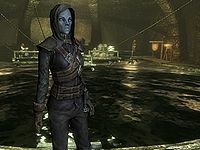 Karliah's mother Dralsi taught her the art of thievery and how to survive in Skyrim living as a rogue, but did not induct Karliah into the Nightingales before her death. Karliah was inducted by Gallus himself. "Not quick enough, otherwise Gallus would still be alive." Karliah: "'To ensure an enemy's defeat, you must first undermine his allies.' It was the first lesson Gallus taught us." "Had I intended to kill you, we wouldn't be having this conversation." "Then I'm in your debt." "More than you'll ever realize. The poison on that arrow took me a year to perfect, I only had enough for a single shot." "Why should I believe you?" "Without the antidote I administered, you'd be as still as a statue. I treated your wounds and didn't leave you defenseless. The poison on that arrow took me a year to perfect. I only had enough for a single shot and yet I used it on you. All I had hoped was to capture Mercer alive." "You should have shot Mercer instead." "I promise you, the thought crossed my mind. The poison on that arrow took me a year to perfect; I only had enough for a single shot." She will then go on to say: "All I had hoped was to capture Mercer alive." If you ask her why, she will tell you: "Mercer must be brought to the Guild to answer for what he's done. He needs to pay for Gallus's murder." If you also ask her how she will prove it, she will explain: "My purpose in using Snow Veil Sanctum to ambush Mercer wasn't simply for irony's sake. Before both of you arrived, I recovered a journal from Gallus's remains. I suspect the information we need is written inside." If you ask what the journal says, she will admit: "I wish I knew. The journal is written in some sort of language I've never seen before." 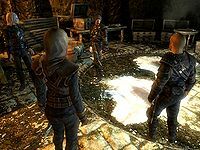 At your suggestion that the journal could be translated, Karliah will exclaim: "Enthir... Gallus's friend at the College of Winterhold. Of course... it's [sic] the only outsider Gallus trusted with the knowledge of his Nightingale identity." At your remark that the word "Nightingale" has been mentioned again, she will go on to explain: "There were three of us. Myself, Gallus and Mercer. We were a anonymous splinter of the Thieves Guild in Riften. Perhaps I'll tell you more about it later. Right now, you need to head for Winterhold with the journal and get the translation. Here, take these as well, they may prove useful for your journey." You will receive four doses of a leveled poison and all that remains is to go and speak with Enthir in the Frozen Hearth. If you ask Karliah if she can come with you to Winterhold, she will explain: "I'm afraid not. There are preparations to make and Gallus's remains to lay to rest. I promise to join you there as soon as I can." Once you've traveled to Winterhold and have spoken to Enthir, the quest Hard Answers will begin. "Anything else, Enthir? Anything about... the Nightingales?" Enthir: "Hmm. This is intriguing, but highly disturbing. It appears that Gallus had suspicions about Mercer Frey's allegiance to the Guild for months. Gallus had begun to uncover what he calls an "...unduly lavish lifestyle replete with spending vast amounts of gold on personal pleasures."" Karliah: "Does the journal say where this wealth came from?" Enthir: "Yes. Gallus seems certain that Mercer had been removing funds from the Guild's treasury without anyone's knowledge." Karliah: "Anything else, Enthir? Anything about... the Nightingales?" Enthir: "Hmm. Yes, here it is. The last few pages seem to describe "the failure of the Nightingales" although it doesn't go into great detail. Gallus also repeatedly mentions his strong belief that Mercer desecrated something known as the Twilight Sepulcher." Karliah: "Shadows preserve us. So it's true..."
Enthir: "I'm not familiar with the Twilight Sepulcher. What is it? What's Mercer Frey done?" Karliah: "I'm sorry Enthir, I can't say. All that matters is that we deliver your translation to the Guild immediately. Farewell, Enthir... words can't express..."
Enthir: "It's alright Karliah. You don't have to say a word." After you have spoken to Enthir, you are directed to speak again with Karliah. Approaching her, she will remark: "We must hasten to Riften before Mercer can do any more damage to the Guild." 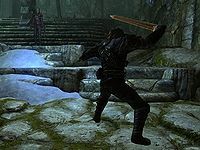 "Gallus's journal mentioned the "Twilight Sepulcher."" "You've come this far, so I see no harm in concealing it any longer. The Twilight Sepulcher is the temple to Nocturnal. It's what the Nightingales are sworn to protect with their lives." "Why does it require that type of protection?" "Everything that represents Nocturnal's influence is contained within the walls of the Sepulcher. Now it seems Mercer's broken his oath with Nocturnal and defiled the very thing he swore to protect." "Thieves and temples. It just doesn't add up." "I felt the same way when Gallus first revealed these things to me. I think given time, you'll understand what I mean." "I'd understand better if less mystery was involved." "As a Nightingale, I've been sworn to secrecy regarding the Sepulcher. I know the Guild doesn't do much to foster faith, but I'm going to have to ask that you continue to trust me." "Very well, we do it your way for now." "I'll make for Riften and scout the situation; see if I can discover what Mercer's up to. When you're ready, meet me at the Ragged Flagon. In the meantime, I wanted you to have this. It belonged to Gallus, but given the circumstances I think he'd approve." "I'll put it to good use." "If the Guild isn't willing to listen to reason, you might have to." "Tell me about Gallus." "He was a scholar, a master thief and a natural leader. Everyone respected him and followed him without question. It was Gallus who inducted me into the Nightingales and honed my skills to a razor sharp point. I owe everything to him. We were... very close." "You were lovers? "Gallus once said he felt comfortable around me; able to let his guard down. I can't help but think that I'm responsible for what happened to him." "Why didn't you kill Mercer?" "Mercer lied to the Guild, branded me a murderer and slandered my name across his network of contacts. For twenty-five years I ran, never sleeping in the same place twice and carefully covering my tracks. Mercer doesn't need to die... he needs to feel the cold sting of fate as his life crumbles in front of him and he's hunted by the Guild." "Might not have a choice next time." "I can promise you if it comes to that, and my back's to the wall, I won't hesitate." "Are you ready to face the Guild?" "I'm ready. Let's go." "Keep your eyes open. I'm not sure what to expect when we enter the cistern." "What if Mercer's there?" "Then we show them Gallus's journal and hope for the best. Remember, we have proof and all he's got is his word." "No, I'm not." "Time is of the essence here, please hurry back." "Please, lower your weapons so we can speak. I have proof that you've all been misled!" Karliah: "Please, lower your weapons so we can speak. I have proof that you've all been misled!" "He didn't need to pick the lock." Afterwards, all four thieves will depart from the vault. If you approach Karliah, you can ask her how Mercer could have gotten into the vault. She will answer very vaguely to your question: "All I can tell you for now is that he's abused his authority as a Nightingale." When you argue about her vague answer about the Nightingales, she will continue to tell you: "As a Nightingale, I took an oath and was sworn to secrecy. Be patient and your time will come." After you have shown Mercer's plans to Brynjolf, you will be told that Karliah has requested to speak to both of you. At this point, the quest Trinity Restored will begin. "Brynjolf, the time has come to decide Mercer's fate." Karliah: "Brynjolf, the time has come to decide Mercer's fate. Until a new Guild Master is chosen, the decision falls to you." Brynjolf: "Aye, lass... I've come to a decision. Mercer Frey tried to kill both of you, he betrayed the Guild, murdered Gallus and made us question our future. He needs to die." Karliah: "We have to be very careful, Brynjolf. Mercer is a Nightingale, an Agent of Nocturnal." Brynjolf: "Then it's all true... everything I heard in the stories. The Nightingales, their allegiance to Nocturnal and the Twilight Sepulcher." Karliah: "Yes. That's why we need to prepare ourselves an meet Mercer on equal footing. Just outside of Riften, beyond the Southeast Gate is a small path cut up the mountainside. At the end of that path is a clearing and an old standing stone. I'd ask you both meet me there." "What is the significance of this place?" "This is the headquarters of the Nightingales, cut into the mountainside by the first of our kind. We've come to seek the edge we need to defeat Mercer Frey." "What kind of an edge?" "If you'll follow me, I'll try to explain on the way." "Tell me about the Nightingales." "Gallus, Mercer Frey and I were once members of what's known as the Nightingale Trinity. The Trinity disbanded twenty-five years ago when Mercer Frey betrayed us by slaying Gallus and dumping his body in the ruins of Snow Veil Sanctum." 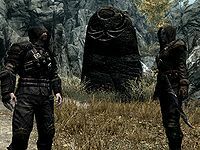 "Were they a part of the Thieves Guild?" "Indirectly. The Trinity is usually selected from the ranks of the Guild although its existence is a closely-guarded secret." "What is their purpose?" "The Nightingales protect the temple of Nocturnal, a place known as the Twilight Sepulcher." "I never met a thief that worshipped anything." "Nocturnal isn't one for worship and reverence. There are no priests and no sermons, no services and no alms. She influences our luck and in return demands payment." "Sounds like a Guild contract." "You're closer to understanding than you realize. The only difference is she doesn't demand payment in the traditional sense and sometimes the cost can be quite high. Whether you know it or not, Nocturnal dictates how well we perform as rogues." "I have my skill, not powers or magic." "Again, you have to think differently. Haven't you ever noticed how our luck behaves? Like a novice picking an impossible lock or a blind man suddenly turning to face you as you reach for his pocket? It's through these subtle means that Nocturnal influences us." "Sounds like she just likes us to suffer." "Nocturnal's whim is the greatest mystery to everyone. There have been volumes written on the subject. Does she exact payment when we die? When we suffer does she revel in our misery? No one knows. The return certainly seems worth the risk though." "Who is Nocturnal?" "She's the mistress of night and darkness and the patron of every thief in Tamriel." "Am I to become a Nightingale?" "It's my hope that you will, yes." "Religion and thieves make odd bedfellows." "This isn't about religion or destiny. This is nothing more than a business transaction between yourself and Nocturnal. Consider this an extremely risky job but with a massive potential for profit, and you'll do fine." "What happened to capturing Mercer alive?" "From the moment you were struck with my poisoned arrow at Snow Veil Sanctum, my path changed its course. Perhaps I couldn't bring Mercer back alive, but together, we were able to clear my name and to put Gallus's memory to rest. I'd always intended Mercer's fate to ultimately be decided by the Guild, and it seems they've spoken." Brynjolf: "So this is Nightingale Hall. I heard about this place when I joined the Guild, but I never believed it existed." Karliah: "The assumption that the Nightingales were just a myth was seeded within the Guild on purpose. It helped avert attention from our true nature. What's wrong, Brynjolf? I can almost hear your brow furrowing." Brynjolf: "I'm trying to understand why I'm here, lass. I'm no priest, and I'm certainly not religious. Why pick me?" Karliah: "This isn't about religion, Brynjolf... it's business. This is Nightingale Hall. You're the first of the uninitiated to set foot inside in over a century. Now, if you'll both proceed to the armory to don your Nightingale Armor, we can begin the Oath." "Now, if you'll both proceed to the armory to don your Nightingale Armor, we can begin the Oath." Brynjolf: "Okay, lass. We've got these getups on... now what?" Karliah: "Beyond this gate is the first step in becoming a Nightingale." Brynjolf: "Woah there, lass. I appreciate the armor, but becoming a Nightingale? That was never discussed." Karliah: "To hold any hope of defeating Mercer, we must have Nocturnal at our backs. If she's to accept you as one of her own, an arrangement must be struck." Brynjolf: "What sort of arrangement? I need to know the terms." Karliah: "The terms are quite simple, Brynjolf. Nocturnal will allow you to become a Nightingale and use your abilities for whatever you wish. And in return, both in life and in death, you must serve as a guardian of the Twilight Sepulcher." Brynjolf: "Aye, there's always a catch. But at this point, I suppose there isn't much to lose. If it means the end of Mercer Frey, you can count me in." At this point, Karliah will turn to you and ask: "What about you? Are you ready to transact the Oath with Nocturnal?" If you respond by saying you don't understand the terms, she will go on to explain: "By transacting the Oath with Nocturnal, you're entering into a business deal. You'll be provided all of the power and knowledge befitting a Nightingale. 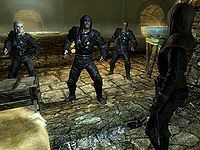 You're free to use those powers as you see fit to further your own goals or the goals of the Thieves Guild." Asking what will be required in return, she will tell you: "In return, you'll be required to defend the Twilight Sepulcher and everything within when the need arises. More importantly, upon your death, your spirit will be bound to the Twilight Sepulcher as one of its guardians." Also asking if there's no going back, she will confirm: "Once the Oath has been struck, the terms are binding. Knowing this, are you ready to undergo the ceremony?" Once you agree, she will say: "Good. After I open the gate, please stand on the western circle." You are now directed to stand on the vacant floor glyph. "My Lady, I've come before you to throw myself upon your mercy and to accept responsibility for my failure." Karliah: "I call upon you Lady Nocturnal, Queen of Murk and Empress of Shadow... hear my voice!" Nocturnal: "Ah, Karliah. I was wondering when I'd hear from you again. Lose something did we?" Karliah: "My Lady, I've come before you to throw myself upon your mercy and to accept responsibility for my failure." Nocturnal: "You're already mine, Karliah. Your terms were struck long ago. What could you possibly offer me now?" Karliah: "I have two others that wish to transact the Oath; to serve you both in life and in death." Nocturnal: "You surprise me, Karliah. This offer is definitely weighted in my favor." Karliah: "My appetite for Mercer's demise exceeds my craving for wealth, Your Grace." Nocturnal: "Revenge? How interesting... very well, the conditions are acceptable. You may proceed." Karliah: "Lady Nocturnal, we accept your terms. We dedicate ourselves to you as both your avengers and your sentinels. We will honor our agreement in this life and the next until your conditions have been met." Nocturnal: "Very well. I name your initiates Nightingale and I restore your status to the same, Karliah. And in the future, I'd suggest you refrain from disappointing me again." "The Guild should possess this item." "Although it would benefit the Guild more than you can imagine, in the end, it would do more harm than good." "The three of us could keep it." "I'm afraid that's impossible." "Sounds like no one should possess it." "Good, then you understand why this is about more than just Mercer's lust for power." "If the Key isn't returned to its lock in the Twilight Sepulcher, things will never be the same for the Guild." Regardless of what choice you made, Karliah will then go on to tell you: "If the Key isn't returned to its lock in the Twilight Sepulcher, things will never be the same for the Guild. As time passed, our luck would diminish to the point of non-existence. And whether you know it or not, our uncanny luck defines our trade." Remarking that it's the first time you've set out to return something, she will agree with your statement: "Very true. In our line of work, it's quite rare we set out to return a stolen item to its rightful owner." She will also hold you back by telling you: "Before we depart, Brynjolf has some business to discuss. I suggest you listen to him." After you have spoken to Brynjolf, you are now directed to meet up alongside Karliah outside the ruins of Irkngthand. At this point, the quest Blindsighted will now begin. 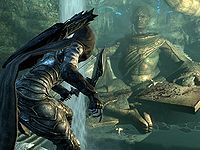 If you choose to approach Karliah again remarking how you don't feel stronger, she will tell you: "With the Skeleton Key missing from the Twilight Sepulcher, I'm afraid Mercer's seen to it that none of us can benefit from Nocturnal's gifts." "But she spoke to us." "You merely transacted the Oath; signed the unwritten contract with Nocturnal. In order for us to receive our abilities... our end of the bargain, I'm afraid the Key must be returned." "Then Nocturnal's angry at us?" "If Nocturnal was truly displeased with me... with any of us, she wouldn't have answered my call. I have no doubt that we still hold her favor and I believe it gives us enough of an edge to defeat Mercer Frey." "We have to catch up to him before it's too late." 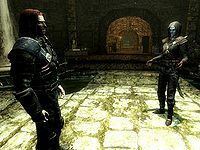 Once you make your way into Irkngthand, both Karliah and Brynjolf will be there to greet you in the Irkngthand Grand Cavern. Karliah will begin the conversation by telling you: "Mercer's been here, I hope we aren't too late." Mentioning the dead bandits from the first zone, she will continue: "Brynjolf and I found them like that. Mercer's doing. We have to catch up to him before it's too late." Once you tell Karliah that you're ready, she will reply with: "We should tread carefully. I wouldn't be surprised if he's left behind a few surprises for us." At this point, both Brynjolf and herself will become temporary followers. You can then ask her if she thinks Mercer knows you are here: "Mercer's been careful so far. I don't think he'd just leave those plans behind unless he had his reasons. For someone in possession of the Skeleton Key, stealing the Eyes of the Falmer would be child's play. No, he means to ambush us down here, I'm almost certain of it." If you tell her she should wait with Brynjolf for a moment, she will remind you they'll catch up eventually with: "Will do. Don't stray too far away or else we'll come after you. ", "No problem, but if you get too far away, we're going to catch up. ", or "All right, but don't wander ahead too far or else we'll be forced to come find you." They will indeed catch up at certain areas of the ruins should you enter them alone. If you tell her to have them follow again, she'll say: "We're right behind you. ", "Lead on, we're ready. ", or "We're with you." Karliah: "Wait a moment... what's that? It's Mercer! Look... down there!" Brynjolf: "I'm on it, lass. Damn it! There's no way through." Karliah: "He's toying with us. He wants us to follow." Brynjolf: "Aye, lass... and we'll be ready for him. Lets keep moving." Brynjolf: "Look at the size of this place. Have you ever seen anything like it in your life, lass?" Karliah: "Can't say that I have. Imagine the riches hidden within these walls." Brynjolf: "So this is what we heard. The entire tower collapsed." Karliah: "The only reason to do that would be to block pursuit. It must be Mercer. We'll have to find another way around." Brynjolf: "Mercer was able to knock this thing down? Gods..."
Karliah: "It's the Key, Brynjolf. In his hands, there's no telling what he's capable of." Brynjolf: "Shor's Bones! Look at that monstrosity." Karliah: "It's a Dwarven Centurion. Very tough and very deadly." Brynjolf: "We can take the beast on or sneak around. It's your call, lass/lad. We're right behind you." Brynjolf: "The stench... this place reeks of Falmer." Karliah: "This must be their hive. We'll have to keep silent if we want to avoid drawing their attention." Karliah: "He's close. I'm certain of it. We must prepare ourselves." Brynjolf: "Then this is it. We do this for Gallus and for the Guild." Brynjolf: "What's... what's happening... I can't stop myself." Karliah: "Fight it, Brynjolf... he's taken control of you!" Brynjolf: "I'm sorry lass, I... I can't..."
Karliah: "Damn! This place is coming down! Quick, get the Skeleton Key and the Eye and lets [sic] get out of here!" Brynjolf: "No luck there, lass. Something must have fallen on the other side of the door because it isn't moving!" Karliah: "We have to find another way out of here before the place fills with water!" When yourself, Brynjolf, and Karliah manage to escape, Karliah will approach you, exclaiming: "I can't believe it's over. Twenty-five years in exile and just like that, it's done. All that remains is to ensure the safe return of the Skeleton Key." "Sounds like it will be a simple task." "I'm afraid it's not that simple. When the Skeleton Key was stolen from the Twilight Sepulcher, our access to the inner sanctum was removed. The only way to bring it back will be through the Pilgrim's Path." "I take it you never used the Pilgrim's Path." "It wasn't created for the Nightingales. It was created to test those who wished to serve Nocturnal in other ways. As a consequence, I have no knowledge of what you'll be facing." "Then we'd best get started." 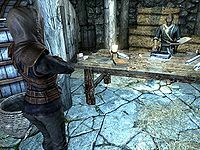 "Brynjolf is needed back at the Thieves Guild to keep order while you're away. And I... I can't bear to face Nocturnal after my failure to protect the Key. I'm afraid you'll have to face the end of your journey alone." "Don't worry. I'll return the Key." "Take this with you. I'm not certain if it will help within the walls of the Sepulcher, but I certainly don't need it as much as you. I've had this bow almost my entire life, and it's never let me down. I hope it brings you the same luck." "I don't understand why you won't come with me." "I've been a Nightingale for a very long time. 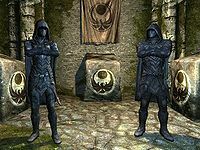 I sold my allegiance to Nocturnal in exchange for many profitable years of thieving. Falling in love with Gallus was wrong. It was a distraction that allowed the Sepulcher to be desecrated and it likely cost him his life. Until the Key is returned, I will never set foot inside that place again." "What's the story with the Pilgrim's Path?" "Even though Nocturnal doesn't desire worship in the traditional sense, the Twilight Sepulcher propagated a small group of priests. Of course, they'd never come into direct contact with Nocturnal but they insisted they had her favor. As part of their "duties," the priests created all sorts of baseless rituals and ceremonies all on Nocturnal's behalf." "This didn't interfere with the Nightingales?" "These priests weren't threat to the Skeleton Key or the conduit to Nocturnal's realm, so they were tolerated. One of their ceremonies involved the Pilgrim's Path, a so called "test of worthiness." If a pilgrim was able to complete the path, it was said that they would become one with the shadows. What that means is anyone's guess." "Tell me about the conduit inside the Sepulcher." 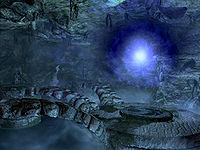 "The conduit to Nocturnal's realm, the realm of Evergloam, has been in Skyrim... well, longer than recorded history. The Twilight Sepulcher was constructed around it by man and mer in order to shield it from those who would exploit its power. It's through this conduit that we're given Nocturnal's greatest gift, our luck. What she gains in return is a complete mystery." 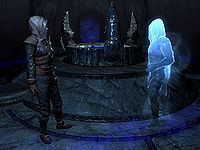 After you have returned the Skeleton Key to the Ebonmere and have spoken with Nocturnal, you are now directed to speak with Karliah, who has now appeared inside the Sepulcher: "I'm glad you were able to bring the Key back safely. Nocturnal seemed quite pleased with your efforts." "What's this about becoming an Agent of Nocturnal?" "Tell me about the Agent of Stealth." "The Agent of Stealth [sic] is the master of remaining unseen. They are able to manipulate the darkness and use it to their advantage. On moonlit nights or in darkened rooms, this agent literally becomes invisible." "Tell me about the Agent of Subterfuge." "The Agent of Subterfuge utilizes shadow to cloud the judgement of those around him. By weaving the darkness to their will, this agent can manipulate others into fighting for the Nightingale for a limited time." "Tell me about the Agent of Strife." "This [sic] Agent of Strife can send forth a tendril of pure darkness into the heart of another, causing great injury to them. At the same time, this tether will bolster the agent's own life force, making him stronger." If you choose to ask Karliah further as to why you cannot be all three Agents, she will respond by saying: "This is Nocturnal's way of maintaining balance. If you ever feel the need to change your abilities, you can return to the Sepulcher and step onto a different circle. Be warned that once you've chosen, you can't reselect for at least a day." "Farewell, Gallus. Eyes open... walk with the shadows." Approaching Karliah again, she will initiate the conversation: "Gallus's Oath has been paid. His actions have satisfied the terms. Now his spirit becomes one with the Evergloam... the realm of perpetual twilight and the cradle of shadow." "They're part of the darkness around us?" When you depart the Twilight Sepulcher, Karliah can be found at anytime in the Nightingale Hall. Due to a bug she may however return to the chamber where Gallus' body can be found in Snow Veil Sanctum. Taunting an enemy "Your death will be swift!" Attacking with a blade "I'll bury my blade in your heart!" Engaging an enemy "Your fate is sealed!" "Nocturnal, guide my hand!" "Dodge this!" "Darkness consume you!" "Shadows take you!" "Your life is forfeit!" "Come, taste darkness's embrace!" "The burden of death approaches!" "By Nocturnal's grace, I will defeat you!" "I bring death from the shadows!" "The shadows will be your undoing!" "I claim your soul for Nocturnal!" Losing sight of an enemy "Hiding only prolongs the inevitable." "A bold but foolish move." "I know you're here. Show yourself." When searching for the enemy "Wait, I hear something..." "I know you're here. Show yourself." After reacquiring the enemy "Come coward, now we fight!" "Enough games, let's end this!" Defeating an enemy "I send you to your rest." "You were no match for a Nightingale." "Shadows consume you." "The afterlife will bring you darkness." "Bless you, Lady of Shadows... I live another day." She is voiced by Moira Quirk. Sometimes when leaving Snow Veil Sanctum a frost troll will have wandered near Karliah's camp. She can become stuck in her conversation because of this. Reloading an earlier save and killing the troll before she progresses through her dialogue solves the problem. Karliah is mentioned in the in-game book, The Nightingales Vol.2. She is the only Dunmer in the game with purple eyes instead of the standard Dark Elf red eyes. 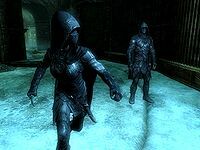 You may not be able to find Karliah in Nightingale Hall at the end of the Thieves Guild quest line. This is most likely caused by not completing enough sidequests for Vex or Delvin. If this is the case, you will instead find her at the very end of the Snow Veil Sanctum, the place where she shot you. The actual bug is apparently caused by the quest Under New Management never starting. It might be possible to fix this issue using the setstage TGLeadership 50 console command. On occasions, she may be found wandering Riften upon trying to return to the Nightingale Hall after the completion of Under New Management. 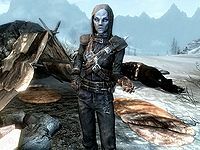 Karliah may also be found stuck in a wait package in the cellar of The Frozen Hearth in Winterhold. One way to fix this issue is to redo the previous quest (get the rubbing and return to the cellar of The Frozen Hearth) and she will be unstuck. Go through the dialogue, then wait 24 hours before meeting her at The Ragged Flagon. This page was last modified on 23 October 2018, at 10:32.